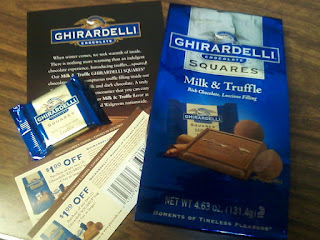 I was selected to get a free bag of Ghirardelli Chocolate Squares (Milk & Truffle) from SheSpeaks. SheSpeaks is a great website that allows women to be sent products to review/try which suit what they are interested in. 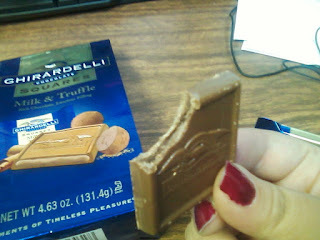 I have seen Ghirardelli sold at Target and Walgreens. I have never eaten a Ghirardelli chocolate before, but this will not be my last! It is a delicious milk chocolate that melts in your mouth. At the very first bite I was delighted to find that there is a truffle creamy filling. It tastes delicious, and I know it will be a hit with my boyfriend. I will be buying these from now on when I want chocolate. Thank you for the opportunity to try these Ghirardelli & SheSpeaks. Trying to show you the inside of the chocolate. Disclaimer: I was sent the product(s) to review. The review is 100% truthful and in my own words.